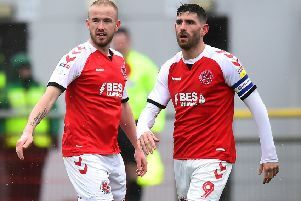 Fleetwood Town’s Lewie Coyle still views right-back as his main position despite joking he’d soon be taking Alex Cairns’ position in goal at Highbury. The 23-year-old is enjoying his second season at Highbury on loan from Leeds United. However, unlike his first year when he was utilised as a right-back or wing-back by Uwe Rosler and John Sheridan, Coyle has taken on a number of roles under head coach Joey Barton. He had featured at left-back earlier in the season, drawing comparisons from Barton with Denis Irwin. 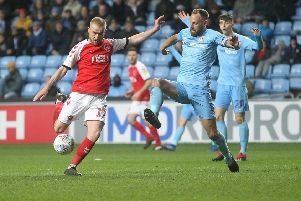 However, when he was suspended for three games after a red card at Rochdale in January, Town forward Wes Burns took Coyle’s shirt at right-back. Since his return, Barton has utilised Coyle in different positions to try and find a team in which Burns and Coyle could both figure. That has seen Coyle on the right of a midfield three and Burns at right-back, Coyle at left-back and Burns on the opposite side and, most recently, Coyle has been on the right of a back three with Burns at right wing-back. For Coyle, the fact that Town beat Plymouth Argyle in that latest switch, using a 3-5-2 formation, shows that it worked. The defender is happy to try new roles and play in more than one position. Nevertheless, he admitted his preferred role is at full-back. When asked about the new job in the back three he said: “I found it OK.
“It was evident in the game that the game plan worked. The new shape worked. “It was something the gaffer wanted to have a look at and I slotted in on the right of the back three. “I enjoyed it and it’s another position ticked off the list! We won the game, got a clean sheet so it’s very pleasing. “It can be a Thursday or a Friday when you get told. “You have to be prepared wherever you get put on that team sheet to be able to adapt. “It is just part of being professional. You cannot just have one position in modern football. “I think it is good to be versatile and maybe give the gaffer a headache in what position to play you. “Sometimes different shapes offer different slots to play in. “Wherever I play I will give it my all and give it a go. “If someone asks me what is your preferred position it is right-back but, again, that is down to the manager.